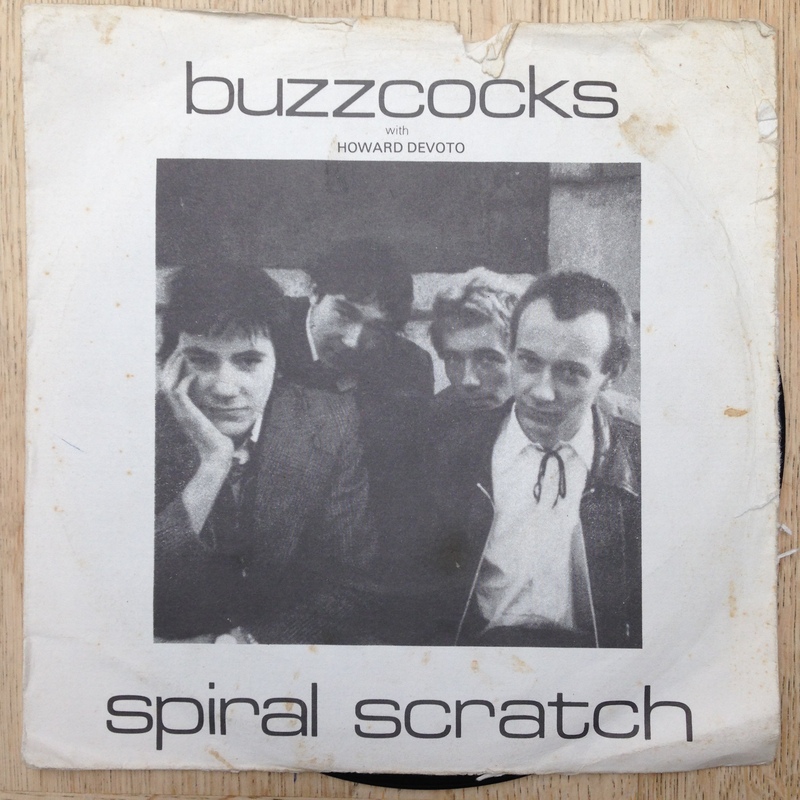 Simon Periton, artist, on the Buzzcocks’ Spiral Scratch EP. SP In some ways I chose it just because a seven-inch single could be the beautiful object in itself. But then I started thinking about which particular seven inch it could be. I think it fits with something I like about the idea of beauty, which I’ve talked about before in connection with my work. Part of starting to cut paper doily pieces was a kind of disillusionment with leaving college and no longer having anywhere to work. I liked the idea of making something that was invested with a lot of time and effort but was essentially just useless and beautiful. And out of that grew the idea of the doily as being quintessentially English and all the notions of Englishness and rebellion. People talk about champagne socialists but actually, most of the revolutionaries I’ve ever come across drink tea all the time. Punk was always a bit like that for me. Now it’s all corporate nostalgic nonsense but from my humble input it was quite under the radar, quick and easy and simple. There was an urgency and a cheapness to the way it got out there. If I think back to that time now, we weren’t wearing luxurious things like Seditionaries and Boy, we were wearing things we’d made ourselves because we didn’t have any money. It was about getting on four buses to go to a village in the middle of nowhere to see some band in a village hall if you wanted to be involved. So in a way, Spiral Scratch is the epitome of that. It’s the first self-produced indie EP. It’s fast and packed full of Devoto’s interesting literary witticisms. It’s black and white and looks as though it were photocopied together. GB So you find it beautiful because it’s quaint and English? SP It’s definitely quaint and English. I think a lot of punk was. I dyed my hair pink when I was about 16, which was quite late, and where we came from in Kent, the only people who loved it and were obsessed with me were the old ladies who had blue rinses. I used to tell them about Crazy Color and one particular old lady was really keen on Pinkissimo. It was all so careful and polite. It’s hard to explain how weird and odd Crazy Color looked at that time. Even straight trousers made you look different. Coloured hair made you a total freak. GB It’s strange that punk seemed so threatening in those days. SP I remember going to visit my grandmother in Kent. She lived in an Oast house. We went on several buses. I’d made myself an Anarchy armband. My grandmother said, “What’s that A on your arm?” I said, “It means anarchy.” And she just said, “That’s nice dear. Would you like some tea? I was fuming with pent-up aggression at that time but the Englishness of her response was so politely rebellious in itself. GB So is it possible for something beautiful to also be subversive? SP There are so many things that are naturally beautiful but generally the things that appeal to me have a shock of the new. So they are aggressive but then they get subsumed into the culture and homogenised. Punk isn’t aggressive at all any more. You’re more rebellious now if you don’t have a tattoo. GB So when you were making pretty doilies after you left art school, that was rebellious? SP Yes, when I started showing the doilies, the whole aesthetic was very minimal, with lots of MDF – and I entertained some of that as a student. But I suddenly saw a tunnel of repetition, farming out smooth MDF shapes and I wanted to do something different. There was a gang of German artists like Kippenberger and Georg Herold that I really liked and they had a kind of humour and playfulness I admired, a kind of punk directness that I respected. When the YBA thing started there was a lot of press about how it was similar in feel to punk and I didn’t think it was. I found it quite conservative and staid. It referenced punk but it didn’t have that spirit and the energy. The doily-making thing was a slightly conceptual move to make something so decorative in that ‘cool’ period. GB But you do really like fussy baroque things? SP Yes I like flowery ornate things and I like quite hard things too. I suppose I found decorative and quaint things subversive and that was confirmed for me when I told people I’d started working on cutting out doilies and people would have this look of horror on their faces. GB Tell me about the journey of having the aesthetic response to something that’s new and shocking like Spiral Scratch, to still finding it beautiful 30 years later. SP It has a poetic simplicity. It’s beautiful in a really obvious way with just the right amount of notes, not too much, not too little. The first 500 copies were in Manchester and I was in Kent, so it was already nostalgic by the time I first got it. Things had changed a lot. But it was so perfectly brilliant, it could fight through that. Of course all these years later it pleases a part of my mind in a different way. But when I first heard it I was struck by the sneery, camp lyric delivery and the two-note guitar solo – and it has these northern phrases I’d never heard before. It was never shocking to me. I’d heard other punk records. I can’t separate the whole thing from my adolescence and the opening up of a whole new world. GB And when you listen to it now, are still filled with a sense of all those possibilities? SP Yes, I’m an eternal optimist in that respect. I get disillusioned with things that aren’t as interesting. There’s a beauty in that feeling of optimism that’s so simple and wonderful so I try to feed that into everything I do. GB Is that more important than ever, looking at how the music business and the art business have evolved? SP Maybe it’s my perception but things seemed to be more simple then. There was as dominant culture and then a few other things going on. I think this record was only intended to be a minor blip. A small route to doing something else, in the way that my doilies were when I first started doing them. GB Do you worry about other peoples’ reactions to your work? If people are no longer horrified, do you still want to do it? SP It doesn’t bother me at all. I think of my audience as my mates and sometimes other artists, but I never think about people like hedge-fund art collectors. SP There are many forms of beauty. There’s an aesthetic dimension to it, so pleasing to my senses. It would have some kind of simplicity and directness to it even though it might still be fussy and baroque in its look. I think it should have something slightly subversive in it, something slightly odd or wrong. There has to be a kind of absurdity to it that’s hard to define. Maybe beauty is a carrier for something else. Something seduces you into wanting to engage with it. If it can subvert your experience somehow after that, then I call it beautiful.